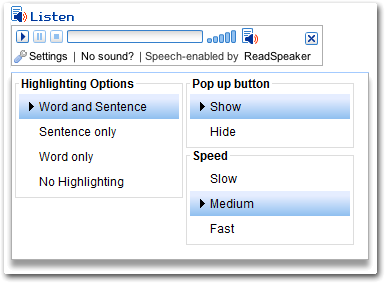 ReadSpeaker allows the text on the website to be read out loud to you. It provides you assistance if you have trouble reading text online. By having the text read out loud to you, you can understand the information on the website more easily. This makes the website more accessible and more pleasant to visit. As a user you don?t have to download anything. A control panel will appear (see image below) and ReadSpeaker automatically starts reading the text of the web page out loud. You can select a part of the text that you want to listen to and then press the pop-up listen button which appears next to the mouse pointer. When you click the pop-up listen button, a smaller control panel will appear (see the image below) and ReadSpeaker will automatically start reading the text you have selected. For more information please visit ReadSpeaker's text to speech online site.